Tredstep Elasticized Half Chaps are designed for working riders who need the best in function and fit, this is a great every day half chap. 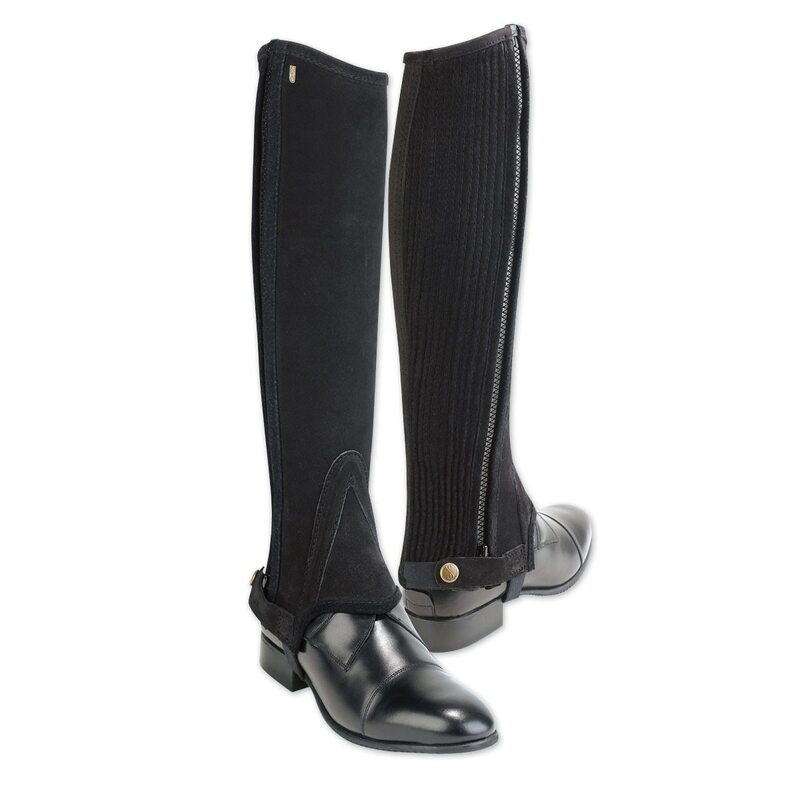 Every shape and size of the Tredstep Elasticized Half Chaps is catered for with an assured fit. Sizes are quoted by calf then height from ankle bone to back of knee. Tredstep Original Half Chaps is rated 4.5 out of 5 by 95. Rated 4 out of 5 by Claire from Depends what paddock boots you wear! The ankle of these chaps is HUGE! However, I frequently ride in a pair of Ariat Terrain boots, and these fit PERFECTLY with them, because the ankle of the Terrain boot is very thick, and some other brands of chaps are too narrow to wear with them. Unfortunately, whenever I ride in my traditional paddock boots, they look a little ridiculous, because there is so much extra room in the ankle, and it causes the chap to sag and look dumb. 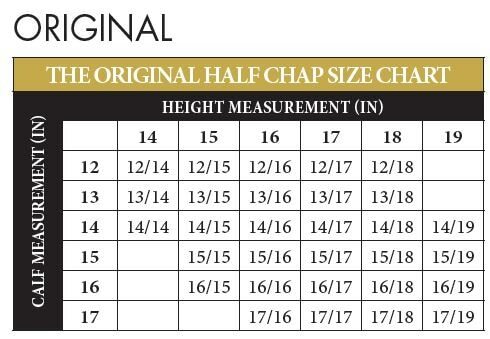 So if you are looking for chaps to fit your Terrain boots, these are definitely what you need, if not, go with a pair that has a more fitted ankle. Rated 3 out of 5 by Jennifer from Leather Too Thin There was much to like about these half chaps - the fit on my calf and the zipper. But I was very disappointed with the thickness of the leather, especially on the inside of the calf. It felt so thin that I thought it would wear through very quickly. Especially considering the cost of the chaps, the inside of the calf should be more protective and durable. I sadly returned them. Rated 4 out of 5 by Meghan from Great fit! Comfy and fit well right away. My first pair of non Ariat half chaps and I like them. Rated 4 out of 5 by water2o from A Little Extra in the Ankle I prefer schooling at home in field boots, but during the down time in the winter, I wanted something that could take a little more abuse in the elements and keep me warmer. These are right on point for price. I do think they run a little large in the calf and ankle. I ended up ordering a size down in the calf. They have a ton of stretch around the calf. The size down also fit better around the ankle. My true measurements ended up being a little loose and bulky around the ankle. Rated 1 out of 5 by qbrown from Wear out fast I bought these half chaps around a year ago, and they already have holes in them. I usually wear my half chaps to school in at home, and these did not hold up for long. Would not recommend these for anyone that rides more than once a week. Rated 5 out of 5 by Susu from Great fit! 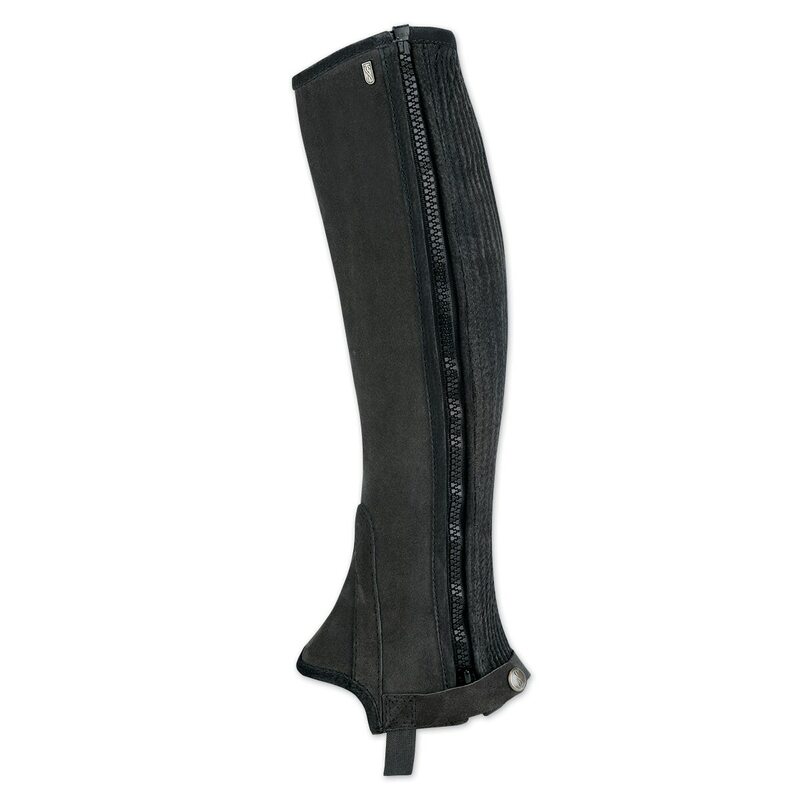 Fit like custom half chaps, look great, and good grip while riding! I measured, and rounded down on the calf and rounded up the height! perfect! Rated 5 out of 5 by Grammie G from Great fit It was great being able to order by width and height because the standard sizes of other brands didn't fit me. The suede is good quality and the zipper is heavy duty. I do not have much trouble with the snap as others have mentioned. 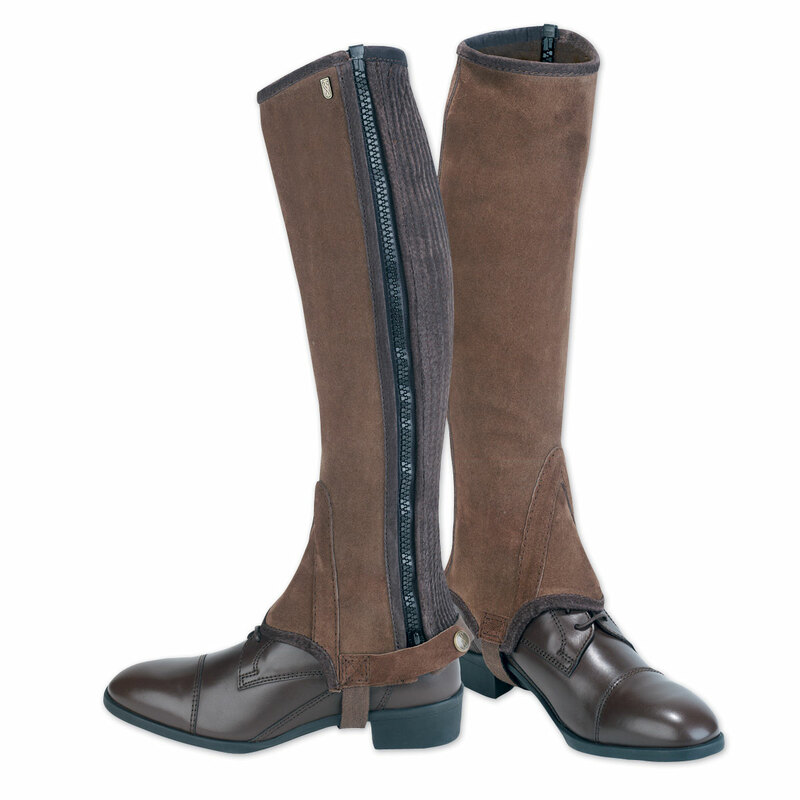 Rated 5 out of 5 by Lisa from Elegant These half-chaps fit perfectly, look elegant, and are easy to put on. Rated 5 out of 5 by Cailin from Beautiful fit and leather I've only had these for 2 weeks, but after wearing them for a few days I'm pretty happy - they fit perfectly and look fabulous. I really like the big zippers - they are easy to zip and seem much sturdier than the zippers on my previous pair of half chaps (and that was what finally failed on them that I bought this pair as a replacement). I hope they prove as durable as my last pair, which lasted for years! Rated 5 out of 5 by Tasking10 from Fits well, durable and not too expensive. 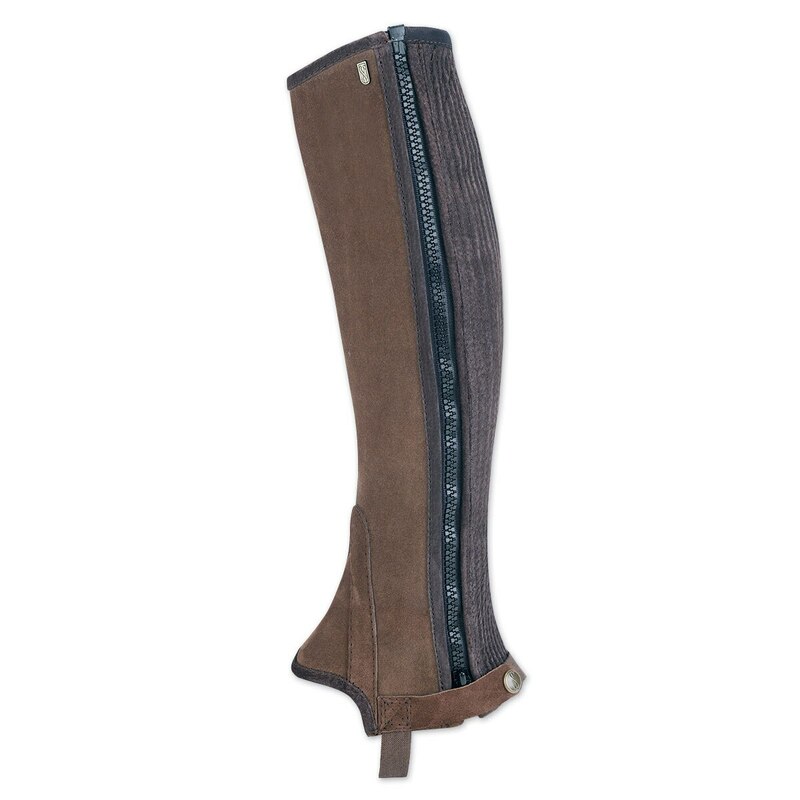 Great sturdy, suede half-chaps that offer sizes down to a slender leg. Look great!